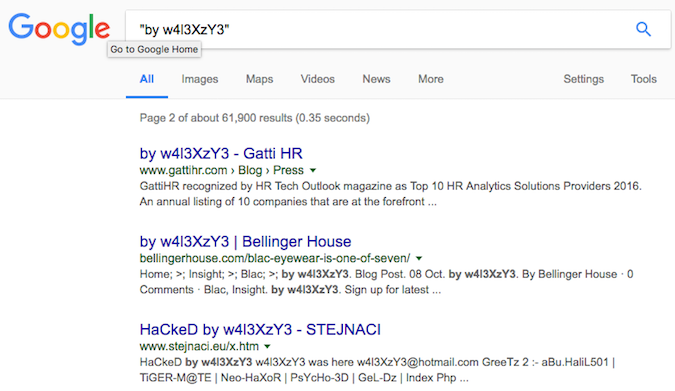 SecurityWeek has noticed that some of the compromised websites have also been re-defaced by a fifth actor. Fortunately, some of the affected sites have already been cleaned up and updated to WordPress 4.7.2. While these attacks appear to be carried out mostly by script kiddies looking to boost their online reputation, researchers believe the vulnerability will be increasingly exploited for search engine poisoning. A recent report from Sucuri showed that more than half of the WordPress websites hijacked last year were outdated at the point of infection. By default, WordPress installations are updated automatically when a new version becomes available, but some administrators have disabled the feature, often due to concerns that the updates may break their websites.